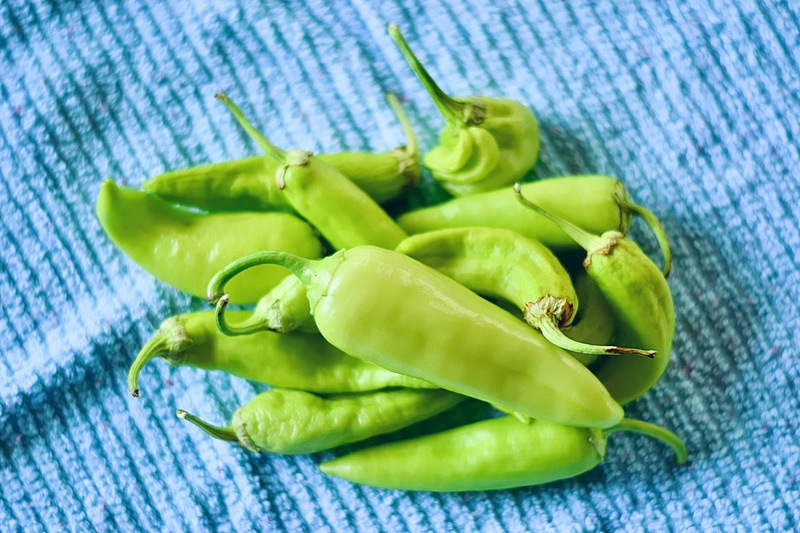 When choosing plants this year, my husband chose a hot banana pepper plant with one thing on his mind: Pickled Peppers. 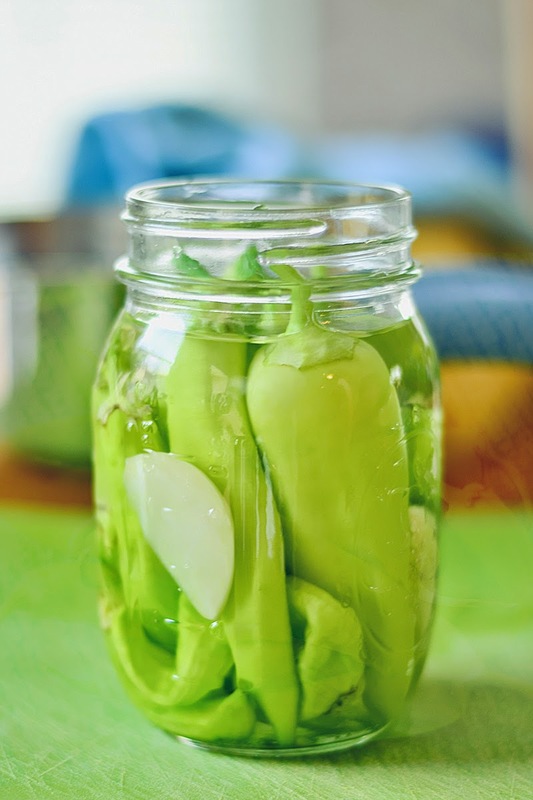 At the time, I had never pickled anything and figured we could give it a try, I suppose. 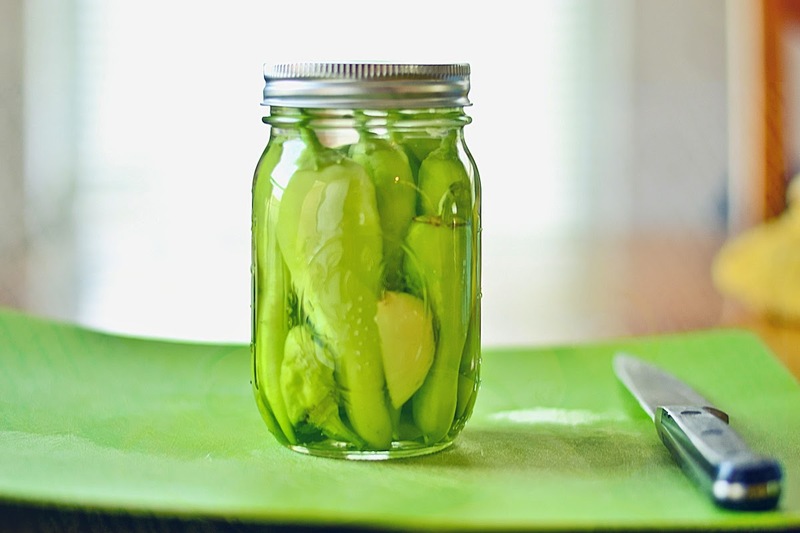 Apparently it went well, because we've pickled about 10 jars so far and I have one [two including this one] left. I've only had one pepper. But every time we smoke or barbeque something, he gets those peppers out. Every time I heat up a freezer pizza... I mean, I don't use freezer pizzas... Ahem, every time I lovingly slave over fresh pizza, he gets those peppers out. We use an easy, 48 hour method, I was skeptical about it at first but it works. They're crisp and pickle-y, just as they should be. We only use vinegar, water and garlic, I used pickling spices once and he didn't like that. Simple is better. Your recipe can be adapted for as much or little you want to make. 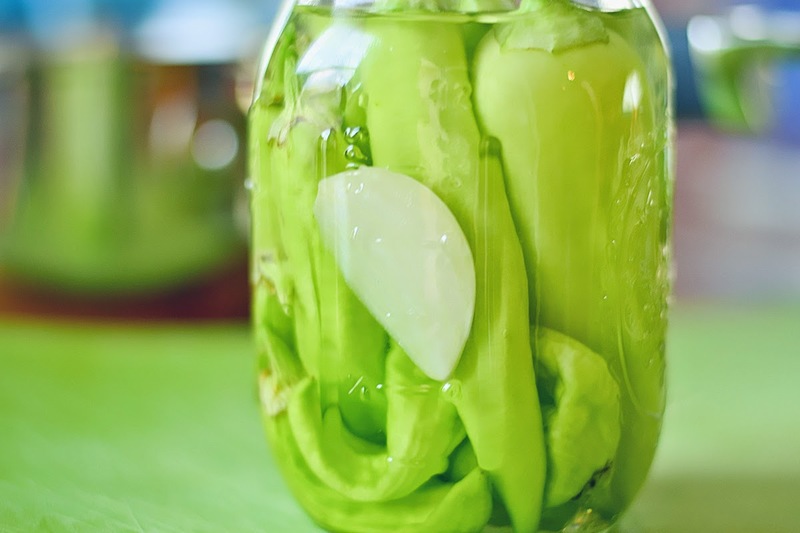 Essentially the pickling juice is just 3 parts vinegar and 2 parts water with a clover of garlic in each jar you make. My recipe will be small, it's what I use when I have just one jar to fill. 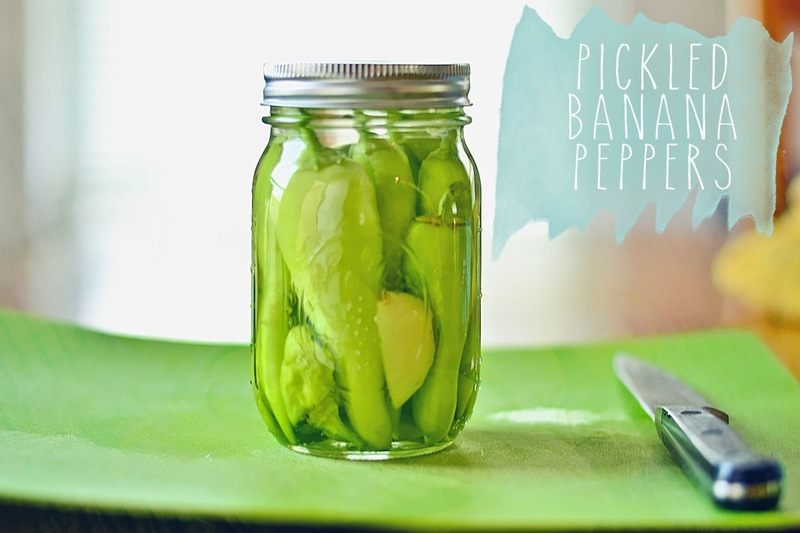 It's ideal if you want to try pickling peppers without having several jars of something you hope you like. To start you will put your vinegar and water into a sauce pan and bring it to a boil. I used 3/4 Cup of Vinegar and 1/2 Water. Once your mixture comes to a boil, turn it off and allow it to cool. About 15-20 minutes. Now, onto your peppers. I can fit about 10-15 peppers into a 16oz. jar, today I had 15. First I cut the stems down. And then I slice them on two sides, like so. This will allow the vinegar mixture to get inside the pepper, past the skin. And place it into the jar. Don't worry too much about where it goes, you can move them around once it is full. 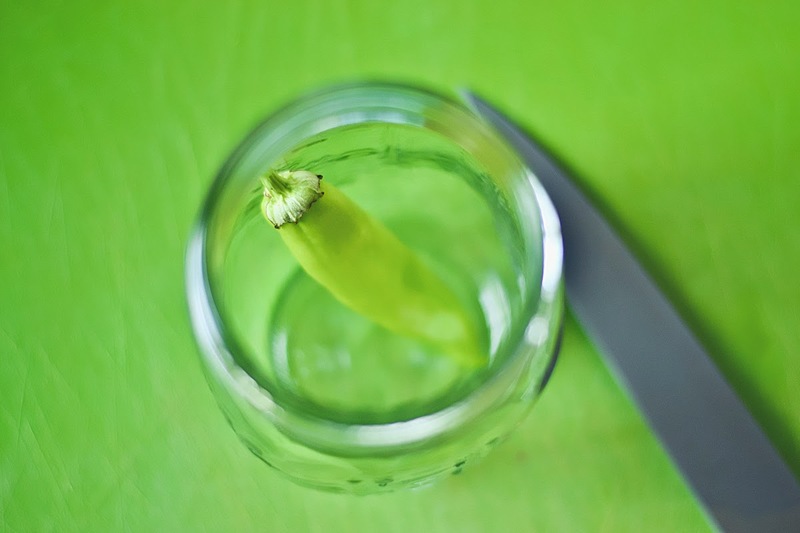 Continue cutting stems and slicing peppers until the jar is full. I do not take the seeds out of mine. If you want to kill some of the heat, cut the top off and pull the seeds out. You don't need to slice the sides if you do this. Take a garlic clove and smash it or slice it into several small pieces. Push it down into the jar. Pour in your vinegar mixture once it has cooled, it should still be warm but not boiling hot. 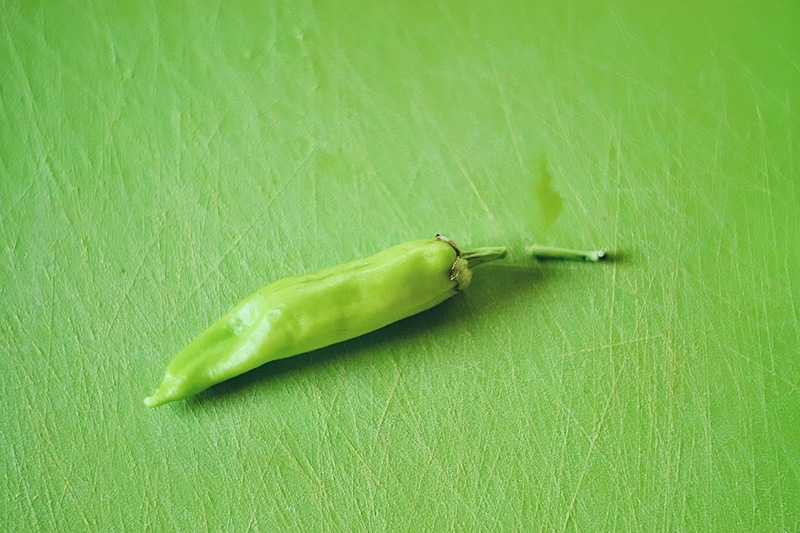 It it's hot, it will cook your peppers and they'll turn out soft or mushy. Fill jar just until it touches around the first ring, if you look above you'll notice my liquid is slightly below the first ring. 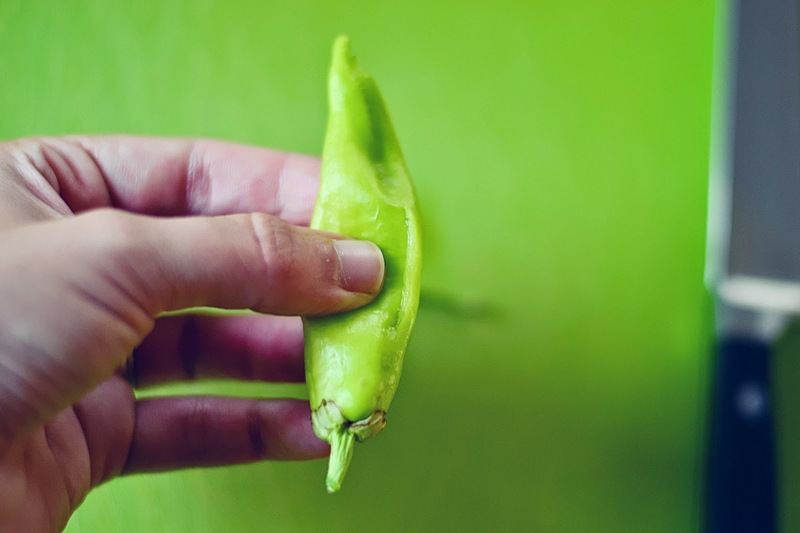 Now, using your finger or the hand of a spoon, a small blunt object, push down on and around the peppers. 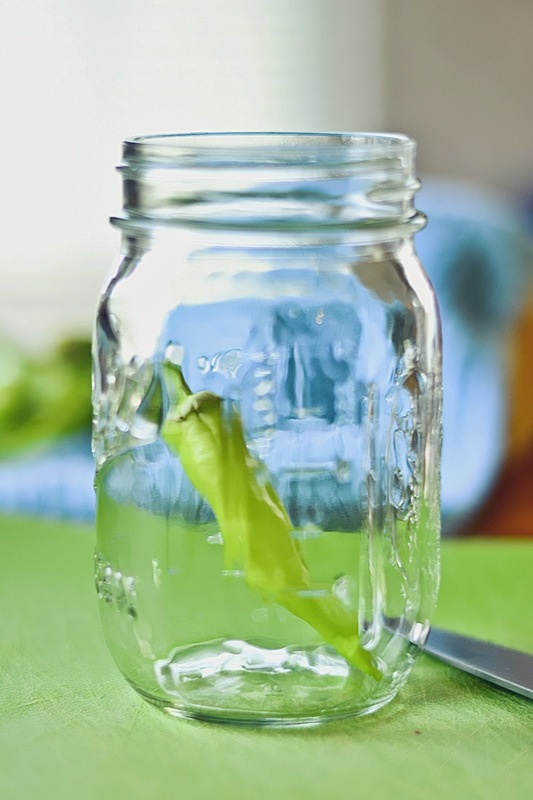 You'll notice some air bubbles coming up as the liquid is working it's way into the peppers. 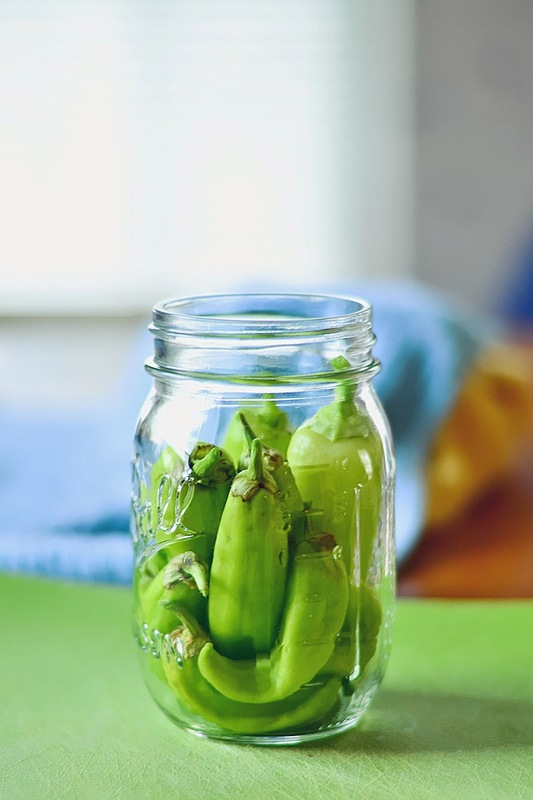 Just give it a little time, occasionally tapping the bottom of the jar very gently on the counter to help rouse them. Your liquid will be a little lower, like mine is above, when the air is out. Top it back off to that first ring, put the lid on and tighten it. 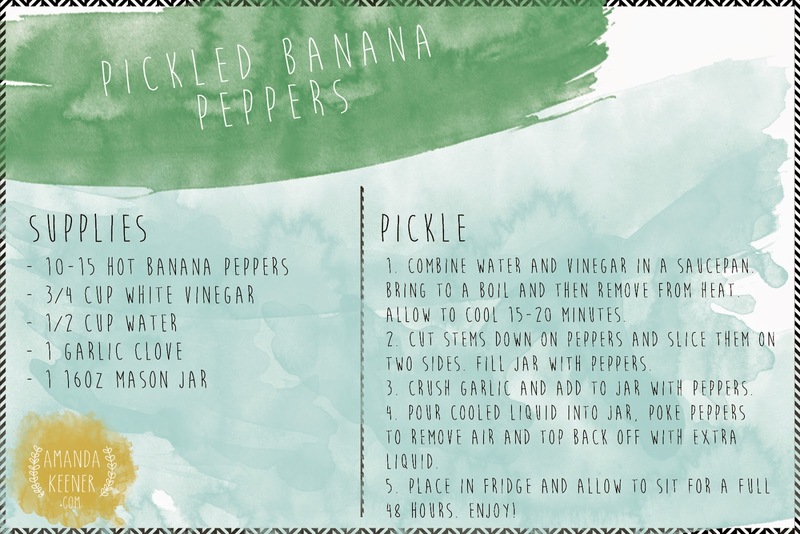 Put your jar into the refrigerator and let it set for at least a full 48 hours. Your peppers will be ready! You can "can" them instead of putting them into the fridge, I haven't actually done this because I don't have all the supplies I need for canning just yet. I know I've read a few blogs that say it's fine to sit the jars directly on the bottom of your pan without a rack, but I'm not a fan of exploding jars. So I have to wait for my rack to come in the mail. Until then, these jars aren't lasting long enough to can anyway! I hope you enjoy them and don't forgot to email me, find me on twitter or instagram to show me your peppers!